This essay is an economic analysis of the fundamental causes of business cycles. Although such analysis has value for investing, the purpose of this essay is for understanding the fundamental economic workings of society. Those primarily interested in investing will benefit greatly from this analysis, which complements my investing essay, Investing & Trading in Equities: Art & Science. I believe that the best explanation for business cycles in the modern world comes from the Austrian School of Economics. Within the Austrian School there is general agreement that business cycles are primarily caused by the periodic credit expansion and credit contraction of central banks. But there are many details & questions concerning business cycles for which there is no "orthodox" Austrian theory. My analysis is therefore an Austrian theory of business cycles rather than the Austrian theory of business cycles. Many people treat business cycles as being due to imponderable forces that come & go like tides. But no events are causeless, certainly not tides. Business upturns & downturns have predictable features, such as the fact that luxuries benefit more from upturns and suffer more from downturns than necessities. Similarly, durable goods & technological goods benefit disproportionately from upturns and suffer disproportionately in downturns. For this reason durable goods production is a more sensitive indicator of recession than retail sales — and this is most especially true for producer durables (machinery & equipment) rather than consumer durables (automobiles, furniture, etc.). Unemployment is regarded as a lagging indicator of recession because businesses will try to cut costs in many ways (reduced advertising, reduced capital spending) before resorting to laying-off workers who have training & experience. Economists who blame recession on excess inventories confuse cause & effect. I do not believe that business cycles would be a feature of a free market economy. Periodic massive misallocations of resources leading to unsustainable booms and recessions would not occur in an economy in which most of the forecasting & resource-allocation was done by entrepreneurs rather than bureaucrats. But there is no free market in money or short-term interest rates anywhere in the world — central planning and control of money & short-term interest by governments is universal. All contemporary currencies are the product of government fiat, banking is controlled by government central bankers and there is severe government regulation of the financial sector. All downturns and misallocations of resources in an economy cannot be blamed on governments or central bankers. A massive earthquake in Japanese urban centers or the simultaneous hijacking of passenger airplanes for use in suicidal terrorist attacks are severely economically disruptive. But these are events, not cycles. For most of human history there was an obvious role of government in disturbances of economic resource-allocation due to warfare. Near the turn-of-the-millennium it began to appear that major wars were becoming a thing of the past. Government ownership of economies (socialism) began giving way to privatization of industries that governments would then regulate. And a trend began towards deregulation. But despite the trend toward deregulation, governments still have firm control of money & banking — and there is little indication that this situation will change soon. Knowledge of the laws of supply & demand from an Austrian perspective — and familiarity with The Austrian School of Economics — would be very helpful for understanding my analysis. I therefore encourage readers to read my review of MAN, ECONOMY AND STATE to the end of the second chapter before proceeding with this essay. The activities of central banks — which are national entities — gave rise to a theory of business cycles by the English Economist David Ricardo, who built on the anti-protectionist arguments of the English philosopher David Hume. In classical economics there was general agreement that recession is the result of misallocation of productive resources. Warfare often disrupts resource-allocation, and to the extent that warfare was a periodic phenomenon, it could explain business cycles. Aside from warfare and seasonality, however, there would be no explanation for periodic misallocations of resources were it not for government control of money. According to Ricardo, English banks (with the backing of the English central bank) could expand credit by making loans in excess of gold reserves held by the banks. The result of this credit expansion was an inflationary boom in the English economy. But as the price of English goods rose, English consumers increasingly bought goods from abroad (which were not selling at such inflated prices). At the same time, foreigners would buy fewer English goods because of the inflated prices. As foreigners increasingly redeemed their English bank notes for gold, the gold flowing out of England resulted in rapidly diminishing gold reserves. Eventually, banks would have so little gold that the credit expansion would be unsustainable and the banks would be forced to contract credit to reduce the excessive pyramiding upon dwindling reserves. The contraction of the money supply would cause prices to fall and the loss of credit would suddenly stifle business activity — resulting in unsold inventories, unemployment and general depression. The price deflation would reverse the balance of payments causing exports to exceed imports. Gold would flow into England and the cycle could begin again. Of course, Ricardo's analysis of England was a theory of business cycles which could be applied to any country — with rising prices & increasing production characterizing an upswing and falling prices & decreasing production characterizing the downswing. The Austrian theory of business cycles updates Ricardo's theory by focusing on the more subtle manipulations of money & credit as exercised by central banks since the beginning of the 20th century. Austrian analysis asserts that in a world of hard money and free banking, the inflationary forces of credit expansion due to fractional reserve banking would not exist. If banks were warehouses of commodity money — gold, for example — then currency would consist of bank notes representing claims on the gold held by a bank. Any bank that made loans in excess of its reserves (fractional reserve banking) would soon find itself insolvent when other banks demanded hard money in exchange for checks & banknotes issued by that bank. This effect on banks is entirely analogous to the effects on countries that occurred after World War I when most nations attempted to implement a fractional reserve gold standard for their currencies. Countries issuing large amounts of currency backed by small amounts of gold found themselves in trouble when other countries sought to exchange currency to obtain gold. (See History of Modern Monetary Standards.) Banks in a free banking system would face similar pressures against fractional gold backing for their banknotes. According to Austrian Economists, fractional reserve banking only became possible through the outlawing of private money and the creation of central (ie, government-controlled) banks — which allowed governments to control money supply and bank credit expansion. In a free market interest rates are determined by subjective time-preference and the supply & demand of loanable money. If there is a low rate of savings the quantity (supply) of loanable money will be low and competition for this money (demand) by potential borrowers will result in high interest rates. High interest rates will encourage more savings and thereby bring the price of loans (interest rates) downward. As with supply & demand for any good or service, a free market will find a "clearing price" for the supply & demand of loanable funds. This clearing price is the natural rate of interest. The natural rate of interest plays an extremely important role in the capital structure of an economy. Entrepreneurs/capitalists base decisions on whether to begin long-term capital projects based on interest rates. If interest rates are low, then borrowing to build a new factory, invest in a telecommunications network or assemble the capital goods for a new business venture appears feasible. Supply & demand of loanable funds will respond gradually to adjustments in business activity. If business investment (competition for loanable funds) rises, so too will interest rates — reducing borrowing for investment. Central bank control of money & short-term interest-rates in national economies is at the root of contemporary business cycles. (For background on the mechanics of short-term interest-rate manipulation by central banks, see Money-Creation by Banks and A "Managed Economy" Under the Federal Reserve System.) When central banks artificially lower short-term interest rates below natural market levels, this results in two major distortions in capital markets. First, those who would save money receive less than the natural rate of interest — and this disincentive to save actually reduces the amount of loanable funds in real (as distinct from nominal) terms. Second, those who would borrow money for large capital projects are paying less than the natural rate of interest — thus encouraging borrowing investors to believe that capital projects are more sustainable than they really are. Artificial lowering of interest rates by central banks is thus accompanied by expansion of the money supply — resulting in an artificial stimulus to spending for both consumer goods and capital goods. This artificial stimulus results in an inflationary boom which is not sustainable. Central banks are ultimately forced to raise short-term interest rates to counteract the inflation, resulting in a bust. Supporters of central bank monetary manipulation justify the practice as a means of leveling-out the business cycle when, in fact, central banker monetary manipulation is the cause of the business cycle! In the 19th century, when money was based on gold & silver rather than government fiat, economic growth was mildly deflationary — because increased productivity lowers production costs. Inflation follows from government expansion of money supply and is not the result of an "overheating" economy that is growing rapidly. A distinction should be made between non-inflationary economic growth due to enterprise & technology and inflationary unsustainable booms due to central bank interest-rate cuts. Lack of clarity about this distinction has misled many economists into believing that there is an upper limit to growth (about 3%) above which growth is inflationary and unsustainable. Artificially low interest rates increase consumption spending, reduce incentives to save and increase investment spending with new fiat money that creates the illusion of new wealth. After having expanded the money supply with credit-expansion, central bankers worry that economic growth is "overheating" the economy, and the bankers then increase interest rates to "fight inflation". This counter-inflationary elevation of interest rates has a devastating effect on capital investment. Many projects which formerly appeared feasible are no longer sustainable and must be abandoned. Used capital equipment (computers, office supplies, etc.) floods the market and manufacturers of this equipment are left with large unsold inventories. Manufacturing slows, overleveraged businesses become bankrupt, employees are laid-off and unemployed consumers reduce their spending. As a result of the recession central banks lower interest rates to stimulate the economy and the cycle begins again. Austrian Theory emphasizes injection effects, asserting that new fiat money (whether printed or created through credit-expansion) disproportionately benefits the first recipients — bankers and borrowers in the case of credit-expansion. But there is a price to pay for the injection benefits received by corporate borrowers — namely capital misallocation. Control of economies by central bankers is a case study in mismanagement & misallocation. The technocrats attempt to steer the economy by looking in a rear-view mirror, ie, looking at government statistics on previous periods. Gross Domestic Product (GDP) includes government spending — as if such spending is a measure of productive economic activity. In compiling the statistic often regarded as the most important — the unemployment report — the US Labor Department adds a "bias adjustment factor" to account for newly started firms that the survey probably misses. In the first half of 2001 this "adjustment factor" amounted to well over half a million jobs — in an economy where newly started firms were few and far between. Market distortions also occur due to anticipations of central banker behavior. When the central bank is on an "easing cycle" of cutting interest rates, businesses often wait until the end of the cycle to ensure getting the lowest rates. During the "waiting period" the economy suffers. The Austrian model of the structure of production is based on a "goods-in-process" model of capital and a time-preference theory of interest. In time-preference theory, interest rates are the supply & demand for loanable funds — based on willingness to supply & willingness to pay for transfer of funds for a specified period. A potential supplier of $100 may be willing to supply that $100 to a borrower for one year in exchange for $6 (ie, 6% interest), but not in exchange for $4 (4%) interest. A borrower may be willing to pay $4, but not $6 in a year's time in exchange for $100. The market of such individuals will ultimately decide the final price (natural rate of interest). In the goods-in-process model of capital, the capitalist who has $100 invested in aging wine for a year receives satisfactory interest in the wine can be sold for $105 (5%, ignoring other costs) if the natural rate of interest is less than 5% — otherwise the capitalist could more easily simply loan the money rather than risk tying it up in capital (wine). Any capitalist who invests capital in land, labor, manufacturing, distributing & retailing facilities will expect to receive compensation for both the risk of the investment and for the natural rate of interest which would accompany a less risky loaning of funds. While the worker is paid quickly for labor, the capitalist must wait for goods-in-process to proceed through all stages of production to final sale. The longer the wait, the longer the natural rate of interest associated with the goods-in-process. To produce a pencil, graphite must be mined and refined, then mixed with clay and carbon-black. The manufacturer extrudes the paste through a tube to form rods and then heats the leads to make them hard & smooth. Wood that has been machined to form grooved slats receive the lead tubes and are pasted sandwich-fashion. After adding paint & eraser, the pencils are boxed, sent to warehouses and ultimately sold by retailers. As with the aging wine, capital is tied-up while goods are in process prior to final sale. In practice, the manufacturer's goods-in-process structure of production is only a portion of the goods-in-process structure for the pencil and of the aggregate structure of production for all goods in an economy. Processing raw fruits & vegetables for sale involves a much less lengthy structure of production than is required for a biotechnology company to research, test, and manufacture a new drug. Austrian economist Frederick von Hayek (winner of the 1974 Nobel Prize in Economics) introduced a graphical representation of the structure of production known as the Hayek Triangle. The horizontal base represents the time-dimension, usually depicted as goods-in-process, but which could also represent time to build a new factory or complete research & development on a new drug. The longer the base of the triangle, the longer the time capital is tied-up before pay-back is expected. The vertical leg of the triangle represents value of the consumable products of the production process — the pay-back. The slope of the diagonal can be interpreted as interest rate (ignoring the risk-of-capital factor). Simplistically, if $100 is invested at the left corner of the triangle and if it takes one year to reach the right corner and if the height of the right leg is equivalent to $110, then the capitalist has earned a 10% return on capital. In a growing economy both the vertical & horizontal legs of the triangle are expected to lengthen. Artificial lowering of interest rates by central banks distorts the triangle by creating incentives to stretch the horizontal leg while at the same time reducing consumer savings & increasing consumer spending (stretching the vertical leg). The boom of malinvestment & spending is followed by a bust of forced capital-project liquidation & reduced consumer spending — shortening the length & height of the triangle as the economy struggles to heal from the damage done by the central bank. Although Austrian economics is purportedly an "a priori science", the structure of production model was created to explain why capital goods industries benefit more during a boom and suffer more during a bust than consumer goods industries. Low interest rates and a stable economy encourage industrialists to invest in productive assets and encourage consumers to invest in mortgaging a house. But low interest rates encourage investment only when the probability of profit (success) is high and the probability of default (failure) is low. Explanations are cheap & plentiful when compared to accurate predictions in economics. From that point of view the Austrian School has an advantage concerning the 1930s depression. Irving Fisher, father of the Monetarist School, had become a millionaire from his invention of the Rolodex, but was margined in the stock market at the time of the 1929 crash. Fisher believed that the age of recessions had ended thanks to the new powers of central banks to manipulate money supply & interest rates. Fisher died heavily in debt to his family after having spent years paying-off back taxes. Keynes too was caught by surprise during the crash, losing three-quarters of the value of his portfolio. By contrast, in the summer of 1929 Ludwig von Mises refused a prominent position at the Kreditanstalt Bank, telling his fiancee, "A great crash is coming, and I don't want my name in any way connected with it." Kreditanstalt, Austria's largest commercial bank (holding more than half of the country's deposits), failed in May 1931. According to the Austrian Business Cycle Theory, the 1930s Depression was a consequence of the inflationary central bank credit expansion of the 1920s. But the Federal Reserve had been extremely inflationary during the first world war, doubling the money supply in the 1915-1920 period. The 1920-1921 recession that followed was sharp & severe — durable goods production fell by nearly 50% in a short period of time. But the recession was over in one year, possibly because wages were permitted to fall while government reduced taxes & expenditures. In Austrian Theory the deflationary forces of recession are the curative agents of asset reallocation. By contrast, government policies in the wake of 1929 resembled those of early physicians who turned minor maladies into life-threatening conditions through their blood-letting practices. The initial causes of the 1930s Depression don't explain why it was so protracted. Statistics cannot speak for themselves when so much insight is required to interpret them. In his monetary history of the United States Monetarist Milton Friedman denies that the 1920s was an inflationary period, pointing to the relative stability of prices. But Austrian economists define inflation by credit/money-supply expansion, not by prices — acknowledging that the productivity growth of the 1920s boom caused prices to remain relatively unchanged while money supply expanded. Similarly, GDP figures that include government spending distort reality in the implication that public works programs contributed to economic growth in the 1930s. Unemployment remained above 15% until the Second World War. But the low unemployment & increase in industrial production of military goods during wartime cannot be taken as signs of prosperity, because the war accompanied rationing and great hardship — destruction of life & wealth. Using a deflator to correct for the high wartime inflation, Friedman & Schwartz (MONETARY TRENDS, p.125) calculated that American per capita personal consumption in 1944 was only 2% greater than it was in 1939. Real prosperity did not return to the United States until well after World War II. From 1920 to 1929 square feet of office space doubled in Chicago, but between 1931 & 1950 not a single new office building or large hotel was built in that city. The Federal Reserve ("the Fed") pursued distinctive monetary policies through discounts, bills (banker's acceptances) and purchase/sale of government securities. But the Fed's policies on time-deposits also contributed significantly to credit expansion. Prior to the establishment of the Federal Reserve System, banks were required to keep the same minimum reserve for both demand deposits and time deposits. But after 1917, the Fed required only 3% reserve for time deposits, compared to 10% for demand deposits (despite the fact that time deposits are effectively demand deposits except for the fact that they cannot be used for writing checks). From 1921 to 1929 demand deposits increased 30.8% while time deposits increased 72.3%. Although many economists had argued that the Fed's discount rate should be high enough to be a penalty rate — making the Fed an emergency "lender of last resort" — the rates were kept low enough that banks could profit by discounting with the Fed and then relending to risky borrowers. The discount policy was justified in the name of supplying adequate credit to agriculture, industry & commerce — and was politically popular. Unlike discounting, where banks obtain reserves only with an obligation to repay — and unlike buying & selling of government securities at the discretion of the Fed — the Fed set a low rate on bills bought (acceptances — almost always banker's acceptances), pledging itself to buy all those bills offered at the cheap rate. This inflationary policy virtually created the American acceptance market, with the Fed as the predominant buyer. The Fed reduced the discount rate from 7% in 1921 to 3.5% in early 1928, but raised it to 5% by the end of the year. In August 1929 the Fed increased the discount rate by 100 basis points to 6%, an apparent attempt to dampen stock market speculation. The sudden cutting-off of cheap money for capital uses & speculation was like curing a case of hyperventilation with strangulation — reminiscent of the Fed's tightening in early 2000 after pumping the economy with money in late 1999 to avert a 1999/2000 Y2K rollover panic. Aside from the effects of easy credit on speculative margin buying, the stock market depends on the profitability or potential profitability of the corporations whose assets are represented by the stocks. Industrial production & the economy had begun to decline months before the stock market crash. The S & P 90 peaked at 254 on September 7, 1929 and stood at 245 on October 10th, but declined more sharply thereafter — crashing on October 24. On October 29 the index stood at 162, not far from where it had been in December, 1928. A common myth holds that Herbert Hoover favored free markets, in contrast to Franklin Roosevelt and the New Deal. In truth, Hoover was only slightly less anti-capitalist than Roosevelt. The New Deal began with Herbert Hoover. As Secretary of Commerce in the 1920s, Hoover had supported high tariffs while at the same time subsidizing foreign loans, particularly for the export of agricultural products. Although the 1920s were a time of economic growth, agriculture, textiles and coal mining all suffered. People clinging to tradition refused to adapt to a changing economy. From the 19th century farmers had demanded inflationary policies (bimetallism, greenbackism) to lessen their debt burdens. In 1929 President Hoover established the Federal Farm Board to authorize loans to farm cooperatives at low interest. Prices for wheat, cotton and other agricultural products were supported by massive government purchases (much given to the Red Cross) while the government searched for ways to subsidize farmers to cut production to slow the rising production & falling prices. The Smoot-Hawley Act raised tariffs to the highest levels in American history, encouraging international protectionist retaliation that hobbled world trade and contributed to the world-wide depression. By 1932 American exports were less than one third what they had been in 1929. To help support wages, Hoover issued a decree through the State Department that reduced immigration from Europe (the largest source of immigrants permitted by law) by 90% within a matter of months. Hoover's policies actually kept real wages increasing for those who remained employed — at a time when unemployment was rapidly increasing. Public works projects, such as Boulder Dam (Hoover Dam) were greatly expanded. Government spending was at a level of 14.3% of the gross private product in 1929, 16.4% in 1930, 21.5% in 1931 and 24.8% in 1932. While Hoover had initially supported a small tax cut that was enacted at the end of 1929, burgeoning Federal deficits led him to support the Revenue Act of 1932, one of the greatest peacetime tax increases in the history of the United States. Personal income taxes were more than doubled in most cases, estate tax was doubled and surtax maximums were raised from 25% to 63% on the highest incomes. Hoover created the Reconstruction Finance Corporation (RFC) as a federal loan agency for organizations that could not obtain money by other means. But supporting failing businesses can cause more harm to the economy than good — especially when financed by increasing the burden on taxpayers. If Hoover had planned to inflict as much damage as possible on the weakened economy, his policies were successful. From August 1929 to March 1933 non-durable manufacturing production fell 30%, durable goods manufacturing fell 77%, department store sales fell 50%, the value of construction contracts fell 90% and factory employment fell 42%. Between 1929 and 1933 general prices fell 25% and wholesale prices fell 37%. By 1932 over 25% of the entire workforce was unemployed. After having increased the discount rate to 6% in August 1929, the Federal Reserve quickly changed course after the October stock market crash, cutting the rate to 4½% by the end of 1929 and further cutting until the rate stood at 1½% two years later. But in September 1931 Britain — which had driven interest rates to 6% to defend its fractional-reserve gold-exchange standard while the economy was rapidly deteriorating — renounced gold convertibility. Within days, 24 out of 47 nations on the gold-exchange standard also suspended gold convertibility. The United States, with over 40% of the world's central bank/treasury gold, lost one seventh of its gold stock within weeks — nearly half going to France. To stem the tide, the US Fed increased the discount rate by 100 basis points on October 9 and added another 1% a week later — the fastest rate increase in the history of the Fed, before or since. At 3½%, however, the discount rate was still near the lowest levels of the 1920s. Despite low interest rates due to growth in so-called "high-powered money" (cash plus deposit liabilities of the Fed to banks), money supply declined considerably in the 1929-1933 period due to declines in bank deposits. 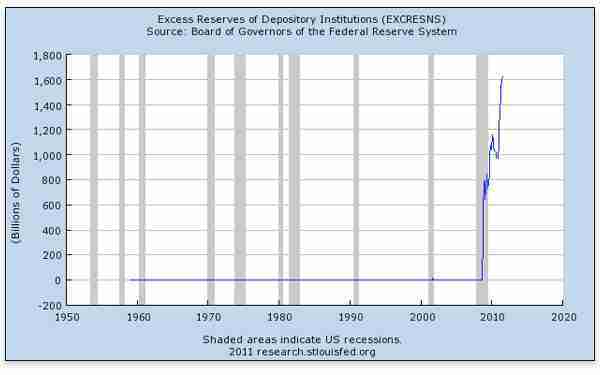 The ratio of deposits to reserves declined from an all-time high of 13.4 in April 1929 to 8.4 in March 1933. In a fractional reserve system, every increase in reserves by the central bank can increase money supply by a large multiple if most of the money is loaned. But in recession, people are more wanting to control debt than to borrow money. And confronted with an economy presenting high risks of business failure, banks are more reluctant to lend. Since the banks are lending much less money than their reserves would permit, money supply can decrease even if reserves are increasing. Bank failures also contributed significantly to the large reduction of deposits. The decline in agricultural exports and prices led to the failure of many rural banks. Near the end of 1930 the failure of Caldwell & Co. bank destroyed the assets of many industrial & insurance companies. Within months over 2300 other banks failed, leading to a precipitous decline in deposits. Between 1930 and 1933 about one third of all US banks failed. Monetarist Milton Friedman claimed that more money from the Fed would have prevented this problem. With the promise of balancing the budget, repealing prohibition, and a "New Deal", Franklin Roosevelt won all but six states in the 1932 election, and his fellow Democrats won large majorities in both the Senate & the House. Within days after assuming office at the beginning of March 1933 Roosevelt closed all banks for 6 business days and suspended gold redemption. It was the longest bank holiday in American history. This action further undermined public confidence in the banking system. Deposit insurance was introduced in 1934 under the Federal Deposit Insurance Corporation (FDIC) and annual bank failures declined for the rest of the 30s. Whether the decline in failures was due to the FDIC or simply due to the fact that the most insolvent banks had already failed is an open question. Roosevelt continued many of the deleterious policies of Hoover, but Hoover had already done most of the damage. Roosevelt won thousands of farmers from the Republicans with his promises and he showed his gratitude with a "domestic allotment" plan which paid farmers for reducing production of seven farm commodities: wheat, cotton, corn, hogs, rice, tobacco & dairy products. The Agricultural Adjustment Act of 1933 raised prices of agricultural goods by paying farmers for not planting. Many cotton farmers plowed-under a quarter of their crops (55% of cotton had been exported prior to the Smoot-Hawley Tariff Act). In 1933 six million piglets and about 220,000 pregnant cows were slaughtered as price-support measures. Cash income to farmers doubled between 1932 and 1936. The Tennessee Valley Authority (TVA) was created in 1933 and the RFC expanded its loans. In the winter of 1933-1934 nearly 4 million unemployed people were temporarily hired for projects which even supporters described as "make work". The National Recovery Administration (NRA) was created in 1933 on the theory that government regulation would make business more efficient. Fourteen hundred NRA compliance officers imposed price controls, minimum wages and a host of other regulations. A dry cleaner was imprisoned for three months for charging five cents above the NRA price for pressing suits. Industrial productivity dropped 25% within six months. The largest New Deal agency was the Works Progress Administration (WPA), created to employ the unemployed in building infrastructure. By 1938 the WPA employed 3.3 million people. There were many accusations of unneeded projects selected for political reasons (or from bad judgment) and of low worker productivity. Monetary policy during the rest of the 1930s was reasonably stable. The discount rate was cut repeatedly in 1933 and from 1934 stood at 1½% for nearly 3½ years. Then the rate was cut to 1% and remained at that level for over 5 years. Both bank deposits and "high powered money" grew at a uniform rate until 1940. Since the discount rate was put above the short-term rate on commercial paper (making it a true "penalty rate"), the use of the Fed for rediscounting became relatively negligible. Hard money would have offered more stability, but under the circumstances it was probably preferable to end the fractional-reserve gold-exchange standard that passed for a "gold standard". Although unemployment remained above 15%, personal income and industrial production rose significantly during Roosevelt's first term. In the 1936 election Roosevelt won all but 2 states while the substantial Democratic majorities were increased in both the Senate & the House. With Mussolini in Italy, Hitler in Germany & Stalin in the Soviet Union, freedom & capitalism were at their lowest ebb. But 1937 brought a severe recession within the depression, with durable goods production dropping nearly 50% in a single year. Despite Roosevelt's popularity as war-President, the high regard for his socialist policies had begun to decline. When World War II ended and communists became the new enemy, there was an increased appreciation for free-enterprise & capitalism, even though it was heavily laden with Keynesianism. Ignorance of market economics not only resulted in the New Deal, but contributed to the 1930s spread of labor-based, class-warfare ideologies — socialism, communism and unionism. Against this backdrop, the economics of John Maynard Keynes was able to gain ascendancy. Keynes attributed business cycles to whimsical psychological forces and regarded government intervention in the market to be a panacea. By moving even further away from the gold standard, central banks gained a freer hand to engage in inflationary practices. Keynesianism — with its emphasis on unemployment & inflation and ignorance of the significance of capital — actually gave governments a tool to undermine the devastating consequences of excessive unionism. By inflating money supply, governments were able to drive down real wages and thus counter the unemployment produced by the excessive wage-rates of the unionists. Keynesian economists began to think an inverse relationship between inflation & unemployment is a fundamental economic law (the "Phillips Curve"). But although workers can be fooled by an unexpected inflation, once government inflation tactics are anticipated, unions will demand wage increases based on price rise expectations. Recession resulting from misallocation of resources (usually due to government policies) require an adjustment period during which productive resources become disengaged from producing goods not in demand and re-engaged into the production of goods that are in demand. It does not benefit the economy to try to encourage consumption of the inventories of the goods overproduced due to resource misallocation — that would simply encourage further misallocation. Even temporary labor unemployment benefits society insofar as it allows for the shifting of labor from less productive to more productive fields of endeavor. Keynesianism encompasses other misconceptions about the economic workings of society, some of which have fallen into disrepute and others of which have a tenacious grip on the perceptions of policy-makers. Keynesianism attributes "excessive inflation" to "excessive spending" — and advocates countering excess inflation by increasing taxes on consumers for the purpose of "sopping up their excess purchasing power". The Keynesian cure for recession is to increase government spending. Thus, Keynesianism emphasizes both fiscal policy (tax & spend) as well as monetary policy (interest-rate & money-supply manipulation by central banks) as tools for governments to control economies. The double-digit inflation combined with recession ("stagflation") of the 1970s caused increasing numbers of economists to question Keynesianism. Early in the 20th century most borrowing was done by governments for spending or by businesses for investment. Borrowing by consumers was mostly limited to mortgages. But between the mid-1970s and the end of the 1990s, the American personal savings rate as percent of total income fell from over 10% to 0% — while consumer borrowing ballooned. Extended periods of inflation made such practices prudent, but these practices have persisted. Part of the decline of savings may have been due to a shift from saving to the holding of equities, but artificially low interest rates are also a disincentive for savings. Both Monetarism and Supply-side Economics were accompanied by ideologies supporting privatization & deregulation — which were enormously beneficial to economic growth. The tax-cuts of Reagan's Supply-side Economics did not result in compensatory tax revenues, but were nonetheless a stimulus to economic growth in the 1980s. Heavy military spending combined with the modest tax revenues resulted in massive growth of government debt. A large government debt having an artificially low risk premium (bonds and T-bills) significantly distorts credit markets away from the natural rate of interest. Monetarism also lost popularity, as governments shifted leftward, and central banks reverted to their Keynesian attempts to manipulate the economy through monetary policy. Interest rate cuts by the US Fed (Federal Reserve, central bank) has often been characterized as "throwing a party for Wall Street". Treating the rate-cut as the party punch has been used as an analogy to illustrate the difference between the Monetarist and the Austrian view. In Monetarism the punch is regarded as a nonalcoholic, but delightful drink. According to Monetarists, a central bank causes the business cycle by occasionally mistakenly interrupting the upward trend by allowing the money supply to contract (the "plucking model" — from the analogy of plucking a string). To Monetarists, the source of economic growth is continued, judicious expansion of the money supply by the central bank — and recessions are caused when central banks injudiciously increase interest rates or refrain from lowering interest rates when it would be appropriate to do so (plucking down the growth). For Monetarists recessions are minor interruptions of growth, not "busts" that follow "booms". In the Austrian view the punch is spiked with drugs or large amounts of alcohol. The drunken revelry boom of malinvestments is followed by a hangover bust (forced liquidations of long-term capital projects). The Austrian interpretation stresses that the net effect of the Fed's action is reduced growth — below what would have been experienced without the Fed's actions. Austrian analysis also differs from Monetarism by emphasizing "injection effects" — the actual economic distortions are the product of how & where the inflationary new money enters the economy. Monetarists are indifferent to the path of new fiat money, being concerned only with the total amount of money in the economy. From 1950 to 1990 Japan was a model of economic growth unlike anything the world had ever seen. From 1960 to 1975 Japan averaged a real GDP growth of 10% per year — and averaged half that much growth in the following 15 years. An important reason for this economic miracle was the remarkable frugality of the Japanese people, who saved nearly one third of their income — money which was invested. What followed, however, was a model of the Austrian Business Cycle and the damage Monetarist & Keynesian remedies can do to an economy. From 1980 to 1989 the Japanese Central Bank (Bank of Japan, BOJ) engaged in a disastrous policy of credit expansion, driving the Official Discount Rate (ODR) from 9% to 2½%. Massive overborrowing by Japanese corporations was spurred not only by the artificially low interest rates, but by the fact that the government effectively guaranteed the loans. In that same period, the Japanese Nikkei 225 stock index rose from less than 10,000 to nearly 40,000 on a path of exponential growth. With 3% of the world's landmass, Japan had 60% of the world's real estate value. These colossal overvaluations also fueled overborrowing by making debt-to-equity ratios appear far lower (and less risky) than they really were. Horrified by the soaring prices in stocks, real estate and the economy in general, the BOJ hiked short-term interest rates (ODR) from 2½% to 6% in the space of a year (1989-1990). To fight the escalating real estate prices, capital gains taxes were raised on profits from the sale of land. 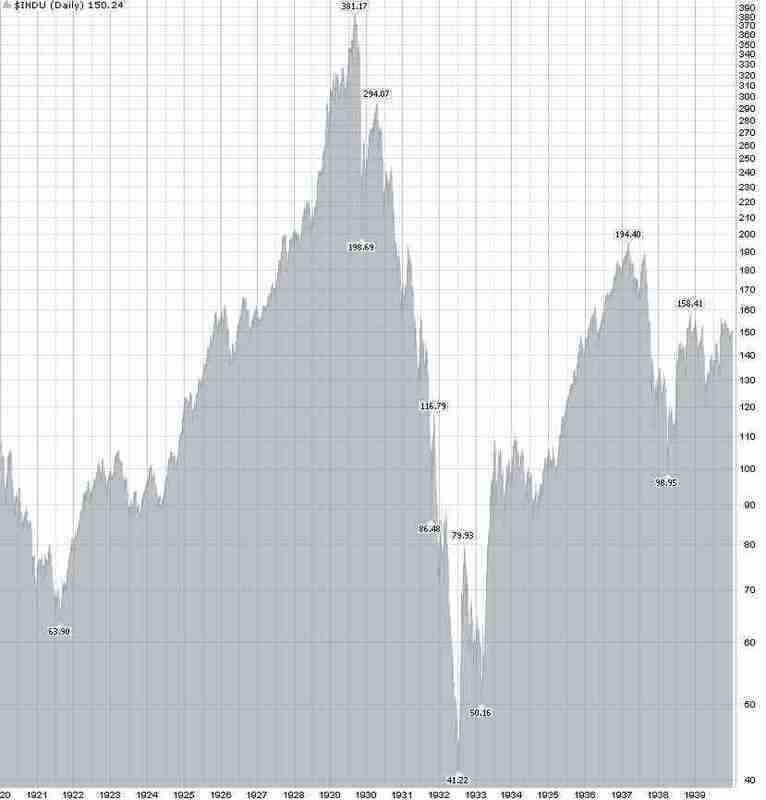 The Japanese stock market began a crash which took it from 40,000 in 1990 to 20,000 in 1992 and 10,000 in 2001. In 1991 Japanese real estate prices began a similar precipitous fall. Equity markets have a real impact on the business community. Stable stock prices and rising stock prices allow corporations to raise equity through issuance & sale of stock and to use stock to make acquisitions of other companies. Plummeting stock prices force corporations to resort to debt rather than equity financing for capital maintenance & expansion — and reduce the ability to use stocks & stock options as a means of compensating executives & employees. When enough businesses face this kind of capital crunch, many of them become financially insolvent, which then reduces the solvency of the banks that loaned them money. 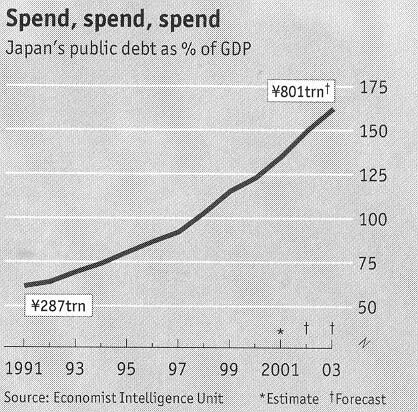 Instead, the Japanese government turned to Keynesian "fiscal stimulus" (deficit spending) as the means to economic recovery. The government spending only served to divert economic resources from market-guided productive activity which could have aided recovery. From 1992 to 2002 government debt rose from 50% of GDP to 125% of GDP as the government littered the country with bridges that are hardly used. Although income taxes were cut in 1994 & 1998, sales taxes were raised in 1997 from 3% to 5% and government spending was not restrained. As much as half of government "stimulus" spending went to construction companies — political allies of the ruling Liberal Democratic Party. Nearly 10% of the Japanese labor force is employed in construction — a large voting block. The Japanese penchant for savings has not benefited the economy because more than a third of the money saved has gone to the postal savings system which buys government bonds and thereby underwrites more government spending (misallocation of productive resources). The Japanese Monetarist monetary policy fared no better than the Keynesian fiscal policy. The discount rate was cut to half a percentage point by the mid-1990s (and was further cut to nearly zero in 2001) in a vain attempt to stimulate the economy by stimulating borrowing (what Keynes called a "liquidity trap"). Stuck with excess inventories and poor business prospects, companies were more concerned with reducing debt and cutting costs than borrowing for capital equipment & expansion. 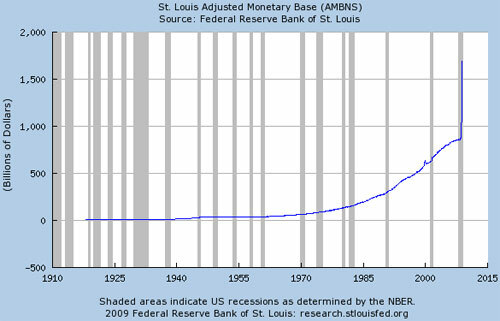 An increase in the monetary base from mid-1997 to mid-1998 of 10% increased broader monetary aggregates by only 35%. Banks burdened with bad debt and risky prospects are unwilling to lend. By 2001 outstanding bank loans had fallen from year earlier levels for 45 straight months, with total loans falling below total deposits in early 1999. Loans remained on the books of banks despite collateral asset values (real estate, stock market equity & failed businesses) that have fallen as much as 80% in the 1990s. The Bank of Japan policy of buying stock equity from banks has benefited neither the banks nor the economy. Loans to companies in danger of default were continually rolled-over. Government loan guarantee programs & financing kept many technically bankrupt small businesses afloat. The government also underwrote banks that otherwise would have failed. With a tradition of lifetime employment many Japanese companies went for years without laying-off workers, despite reduced sales & production — and huge losses. A cycle of deflation began in earnest in 1998 as companies began cutting prices, cutting employees and cutting purchases of supplies. Prices fell 1.5% in 1998 and 1999. Monetarist economist Milton Friedman, "New Keynesian" (ie, Monetarist Keynesian) Paul Krugman and others have advocated increasing the money supply (reflation, to combat deflation) as the solution to Japan's problems. The Bank of Japan (BOJ) has been told to weaken the Yen by printing more currency and buying US Treasuries to stimulate exports. Exports only constitute 10% of the Japanese economy and a cheaper Yen would drive up the cost of oil & other imports (and possibly lead to competitive devaluations by neighboring governments). Inflation would only worsen Japan's problems. In sum, the Japanese central bank created an inflationary economic bubble of overspending & overinvestment by monetary expansion. When the bubble burst, government underwriting of banks has allowed the misallocation of resources to continue. More misallocation of resources results from misguided government programs attempting to save inefficient companies (and whole industries) producing goods not in demand. If loans were foreclosed and the businesses were liquidated, the physical assets & employees could be re-directed to more productive use. Government spending on construction and programs to maintain unproductive employment has only served to further misallocate resources while increasing national debt. The solution to all these problems in Japan and elsewhere is the free market — abolish central banks and eliminate government attempts to underwrite & stimulate the economy — programs that waste money while directing resources away from their most productive uses. Procrustean theorists struggle to fit every event into their predefined molds. But the economic boom of the late 1990s and the turn-of-the-millenium bust involved important factors aside from the actions of central bankers. The role of computers in business and spending on computer technology by business was unprecedented in this period. The fear that the Y2K computer bug would have catastrophic consequences led to literally hundreds of billions of dollars being spent on reviewing & upgrading computer systems. At the same time, Internet & cell phone technology appeared to have the capacity to radically alter the way people live & conduct business. Technology & tools have always been the principle means by which humans have increased their productivity. Computers have recently played a major role in increasing worker productivity. From 1995-2000 annual output per worker grew by 2.5% in the US as compared with an average 1.4% in the 1975-1995 period. The gains in Europe were only half as great — a difference which a University of Groningen study by Bart van Ark attributed to greater American deregulation in the industries that are the heaviest users of information technology, such as finance and wholesale trade. Other analysts, however, say that a big increase in part-time working in Europe has also served to depress productivity growth. In the 1950s three-fifths of financing for American commerce & industry was through commercial banks. But in the 1990s that fraction had shrunk to one-fifth, as companies increasingly financed themselves through venture capitalists, common stock sales and initial public offerings (IPOs). Stock markets surged upward as a result, technology stocks in particular. An investor who had bought $1,000 of Yahoo! stock at the time of its April 1996 IPO would have had shares worth nearly $100,000 in mid-2000. An investor who had bought $1,000 of EMC Corporation stock in 1990 would have had shares worth $1.6 million by the end of the decade. The capital-goods intensive, technology-laden NASDAQ stock index grew at an extraordinary pace, giving an 85% return for the year 1999. The extraordinary economic growth in 1999 would ordinarily have been under anti-inflationary attack by the Fed, but fears of panic at the time of Y2K caused the Fed to print large amounts of money, to refrain from raising interest rates and to keep lots of "liquidity" in the economy. High returns attracted a great deal of money into the stock market. By the end of the 1990s fully half of Americans had some form of investment in the stock market, an unprecedented level of stock market participation. On-line investing became a national pass-time. A nation of people that invests in equities does far, far more to benefit the economy than a nation of spenders. Investment, not spending, is the engine of economic growth — and US growth rate began to exceed 5%. Growth in capital goods & technology accelerated productivity faster than money-supply expansions & government-spending increases — thereby limiting inflation and allowing governments to accumulate surpluses. Buying stock provides companies with equity that can be used to conduct research, expand into new markets and grow. Stock with appreciating value can be used like cash by companies to compensate employees and to acquire other companies. As long as stock prices were appreciating, investors were not concerned about receiving dividends — allowing companies to use their retained earnings for further expansion. Investors were also very forgiving about lack of earnings for new companies with new technologies attempting to establish themselves. Stock market investors who are willing to take the risks of venture capitalists can be richly rewarded — as in the case of Yahoo! investors who earned a 5,000% return in 5 years despite the fact that there were no earnings until 3-and-a-half years after its IPO (and even those "earnings" were pro forma). When the Y2K turnover came & went without catastrophic consequences there were bound to be large reallocations of capital. After such massive expenditures on upgrading computer hardware & software in preparation for a possible disaster, businesses would naturally be expected to refocus spending on areas that had been neglected due to the urgent computer-related deadline of January 2000. In the Spring of 2000 the US Federal Reserve resumed a stringent policy of raising interest rates in the name of preventing inflation. US Unemployment levels were at record lows, crime rates were at record lows, stock market levels were at record highs and economic growth was very high. Although the Fed had expanded the money supply considerably in previous years, thereby satisfying the Austrian definition of inflation, growth in productivity had been strong enough to counter central bank policies — prices remained stable. Although Fed Chairman Greenspan denied under Senate testimony that he was targeting the stock market, references in this speeches to the inflationary "wealth effect" associated with rising stock prices, unsustainable returns and rates of growth, etc. caused many to question his credibility. Greenspan said under testimony that by raising interest rates the Fed would prevent possible future inflation. Short-term interest rates were pushed so high that the yield curve inverted, ie, long-term rates were actually less than the short-term rates controlled by the Fed, suggesting that the market was anticipating the disinflationary/recessionary effects of central bank credit contraction. A more devastating and immediate attack on the American Economy, however, came from the Justice Department, which branded Microsoft Corporation a monopoly and threatened to break-up that company in the name of consumer protection. Microsoft lost $70 billion in market capitalization in a single day — on one ruling — and eventually lost hundreds of billions as the Justice Department continued its assaults. Technology is an intricate web of interdependence and this is especially the case with MicroSoft. Very many company's fortunes were tied to products built around MicroSoft. The devastating damage to MicroSoft had a domino effect across the whole technology sector — including MicroSoft's competitors and eventually the whole economy. Rather than describe the Internet "dot-com" startups as the product of irrational investor mania, they could be viewed as the equivalent of long-term capital projects of Austrian Business Cycle Theory. The new Internet companies were usually years away from profitability and were predicated on the assumption that the economy would continue to grow — and the Internet along with it. But the boom had been the artificial boom of central bank credit expansion followed by the bust (recession) provoked by sudden central bank credit contraction. Austrian business cycle theory does not preclude faddish investments driven by investor psychology. Assets such as tulips that are attracting investor attention can result in price increases that reinforce the expectation that prices wil continue to increase. Artificially low interest rates can help provide artificial capital that helps feed the mania of malinvestment. For the whole of the year 2000 the Federal Reserve maintained high interest rates, seemingly indifferent to the fact that the NASDAQ had lost half its value and that the economy was rapidly deteriorating. In a free market for money, interest rates fall as economic conditions worsen because businesses have fewer opportunities and are more concerned with managing debt & costs — an effect which lessens the burden on debt-strapped companies. But central bankers are bureaucratic central planners guided by backward-looking government statistics rather than market forces. Central bankers can do as much damage by credit contraction as by inflationary credit expansion. Only in January 2001 did the Fed begin to cut interest rates — continuing to cut rates very aggressively through the whole of the year 2001. Some critics of Austrian Business Cycle theory have suggested that savvy entrepreneurs would anticipate the effects of central bank credit expansion/contractions, thereby reducing the intensity of business cycles. Austrians have responded that it is more difficult to forecast government actions than consumer demand. Nonetheless, the fact that interest rates on long-term bonds remained relatively unchanged through most of the year 2001 suggests that the market was anticipating the inflationary effects of central bank credit expansion. Nor did the market respond much to the "economic stimulus" of central bank rate cutting through most of 2001 (expanding M3 growth from an annualized 10% to 14% — the fastest money supply growth in 20 years). As in Japan, central bank attempts to encourage borrowing through artificial lowering of interest rates could not succeed at a time when economic deterioration is forcing businesses to cut costs & reduce debt. The ineffectiveness of interest rate cuts under such conditions has been called "pushing on a string" — in reference to the fact that a piece of string is not a rigid body and will simply curl around the finger when pushed. Since capital spending is cut significantly when economic conditions deteriorate, productivity growth and technological innovation declines. The year 2000 was the first year since 1994 that the number of assigned patents dropped (falling 2.3%). Although the American housing market boom and bust of the first decade of the millennium was associated with an artificial credit expansion, the impact was not concentrated on capital goods and the central bank was not the only responsible agent, unlike the case for the classical Austrian business cycle scenario. The Federal Reserve was no less responsible than the Government Sponsored Enterprises (GSEs) Fannie Mae and Freddie Mac. Fannie Mae (the Federal National Mortgage Association) is a government agency created in 1938 which monopolized the secondary mortgage market in the United States until 1970. In 1968 Fannie Mae was converted into a shareholder-owned "private corporation". In 1970 Freddie Mac (the Federal Home Loan Mortgage Corporation) was created, and in 1989 it was made a GSE modeled after Fannie Mae. The purpose of both GSEs was to make borrowing for home ownership easier for Americans, especially those of limited financial means. Neither GSE issues mortgages directly. Instead they purchase mortgages from banks & other lenders and convert those loans into mortgage-backed securities which are sold like bonds. The GSEs guarantee that the principal & interest for all mortgages they purchase will be paid whether or not the homeowners default. The GSEs charge a fee for assuming all credit risk. Although ostensibly private companies, there was a widespread (and ultimately vindicated) perception that the federal government would not allow the GSEs to fail. The GSEs were given monopoly privileges against which no true private enterprise could compete. Five Board members of both GSEs were appointed annually by the President of the United States. Both GSEs had a line of credit with the US Treasury Department, and both were exempt from state & local income tax on corporate earnings. Fannie Mae Discount Notes became the second-largest short-term notes issued — second only to T-Bills, and paying a yield that reflected implicit government backing. From the 1990s both GSEs held rather than sold most of their mortgage-backed securities — issuing debt below the yield of the securities and profiting from the spread. FDIC Bank Holding Company Act requirements that impose capital/asset ratio minimums of 3% on other financial institutions made no such requirement of the GSEs. Shareholders pressured the GSEs to take more risky loans so as to enhance profits. Those originating the loans became less wary of risks because they were able to transfer the risk to the GSEs. Subprime loans are often considered to be loans made at high rates of interest to people with poor credit (a FICO credit score of less than 660). But at the peak of the subprime lending boom — 2005 & 2006 — most subprime loans were made to people with good credit, but who were borrowing more than their assets or income could justify. Many borrowers (both prime and subprime) obtained Adjustable-Rate Mortgages (ARMs) which were tied to federal interest rates, but gave lower initial interest as a sweetener. In 2005 43% of first-time buyers purchased their homes with no down payment, and the median down payment for a $150,000 home was 2%. This can be compared to an average down payment of 18% for first-time buyers in 1976. By 2006 20% of the entire mortgage market was subprime, and 81% of those loans were securitized. There was political pressure to make home loans more accessible to more voters. The increased risk was justified as a social service. The Community Reinvestment Act (CRA) was an important instrument in implementing this policy, by requiring banks as well as GSEs to make subprime mortgage loans. The CRA empowered politically favored "community groups" to pressure local banks to make loans to people who were not credit-worthy. Both GSEs increased subprime mortgage purchasing in the 1990s. The GSEs operated relatively free of congressional oversight and market discipline. When a congressman made public the outrageous compensation received by GSE executives they threatened to sue him. Near the end of the Clinton administration the Department of Housing and Urban Development (HUD) imposed "affordable housing" quotas on the GSEs. These quotas were later increased under the Bush administration — lowering mortgage requirements even further so more people could buy houses they couldn't afford. By 2007 HUD required that 55% of loans made by the GSEs be to borrowers at or below median income. In 2003 — when the GSEs were the only two Fortune 500 corporations exempt from Securities and Exchange Commission (SEC) regulation — three Freddie Mac top executives were ousted for obstructing an accounting probe. Freddie Mac was fined $125 million by the Office of Federal Housing Enterprise Oversight (OFHEO) for understating earnings by $5 billion. In 2006 the OFHEO fined Fannie Mae $400 million for accounting fraud. In April 2006 Freddie Mac was fined $3.8 million by the Federal Election Commission (the largest fine in FEC history) because of illegal campaign contributions, much of which had benefited members of the House Financial Services Committee. By 2008 the two GSEs owned or guaranteed about half of the $12 trillion worth of mortgages in the United States, including at least 70% of new mortgages being issued. Mortgage lending had become so politicized that the GSEs were required to have at least 56% of their mortgages with individuals having below average income, and at least 35% of the mortgages had to be in geographic areas deemed to be underserved by other companies. The "housing bubble" began bursting in 2006. The Federal Reserve had played its role in the credit expansion and collapse that led to the liquidity crisis. The Federal Funds Rate was slashed from 6.5% in January 2001 to 1% by June 2003. After one year at 1% the Fed ratcheted rates back up to 5.25%. Conventional 30-year mortgage rates fell from about 8.5% in 2000 (10% in 1990) to below 6% in 2003, remaining mostly below 6% until late 2005, peaking to about 6.5% in the summer of 2008. One-year Adjustable Rate Mortgages (ARMs) dropped below 4% in 2003, but rose to about 6% in 2006. Because of lower mortgage rates, lax lending practices and ever-increasing housing prices, real estate loans more than doubled between 2001 and 2008. In 2005 & 2006 40% of home purchases were not primary residences. 28% of the homes purchased in 2005 were for investment and 12% were vacation homes. Nationally, housing prices peaked in 2005, although regional differences were large. Between 2001 & 2006 Miami, Los Angeles and Phoenix saw 80% price appreciations, but prices appreciated less than 10% in Dallas, Detroit, Denver and Atlanta over the same period. The states with the highest subsequent foreclosure rates were California, Florida, Michigan and Ohio. The first two states had seen price appreciations above 80% in the 1998 to 2006 period, but the second two were among the states with the lowest price appreciations. With Fannie and Freddie assuming the risk, by 2008 40% of subprime loans were generated by "automated underwriting". Between 1994 and 2003 subprime mortgage loans increased ten-fold. As interest rates began to rise, however, so did the mortgage default rate. In 2007 there were 1.3 million US homes subject to foreclosure, up about 80% from 2006. In March 2008 the delinquency rate on subprime loans having Adjustable Rate Mortgages was 25% — a five-fold increase from 2005. By August 2008 more than 9% of the entire $12 trillion US mortgage market was delinquent, and by September house prices had plummeted to the point where 18% of homeowners had negative equity (homes worth less than their mortgages). In March 2007 Fannie Mae terminated its agreement to buy mortgage loans from New Century Financial Corporation, the second biggest subprime mortgage lender in the United States. New Century filed for bankruptcy the next month, and the bankruptcy examiner later charged that New Century's auditor had colluded in concealing financial problems. In July 2007 the investment bank Bear Stearns disclosed that two of its subprime hedge funds had lost nearly all of their value due to the meltdown of the subprime mortgage market. Shortly thereafter investors initiated legal action against the bank. By March 2008 the insolvency of Bear Stearns was prevented when the firm signed a merger agreement with JP Morgan Chase for a stock swap worth $2 per share of Bear Steans (down from $172 per share in January 2007) and a $29 billion non-recourse loan from the Federal Reserve to compensate Chase for the risk of assets the company was accepting. The subprime mortgage crisis did not remain confined to the United States. Northern Rock, one of the top mortgage lenders in the United Kingdom, began subprime lending in 2006 with Lehman Brothers underwriting the risk. In September 2007 there was a run on the bank, resulting in two billion pounds being withdrawn before the British government announced that it would guarantee all Northern Rock deposits. In February 2008 Northern Rock was nationalized. The Basel Accords, which provides rules for international banking, mandated that banks have capital reserve of 8% for corporate loans, 4% for mortgages, but only 1.6% for mortgage-backed securities — creating an incentive for banks to hold mortgage-backed securites. Sovereign debt (government debt) is regarded as risk-free by the Basel Accords, and hence requires no capital reserve. The American Securities and Exchange Commission (SEC) mandated that the largest United States investment banks comply with the Basel Accords — further contributing to the financial meltdown in the USA. On July 11, 2008 IndyMac — the seventh largest mortgage originator in the United States — was seized by the Federal_Deposit_Insurance_Corporation (FDIC) when the bank failed. On September 7, 2008 Fannie Mae and Freddie Mac were taken over by the federal government and placed under conservatorship of the Federal Housing Finance Agency (FHFA) (a virtual nationalization of the mortgage industry). Common stock of the GSEs, which had been trading at close to $80 per share for most of the decade, was soon below $1 per share (delisted from the New York Stock Exchange on June 16, 2010). Dividends on the preferred shares of the GSEs — held by many commercial banks — were suspended. The financial obligations of the two GSEs were estimated to be about $5 trillion, close to half the value of the federal national debt. The US Treasury Department pledged $100 billion to each GSE to maintain solvency. On September 15, 2008 Lehman Brothers investment bank filed for the largest bankruptcy in United States history (IndyMac Bank had been the ninth largest). Lehman had closed its subprime lender, BNC Mortgage, a year earlier, but was still holding large positions in mortgage-backed securities which had huge losses in 2008. September 12 was the maturity date of more than $1.2 billion in unsecured loans that Lehman owed Freddie Mac. Also on September 15, rating agencies downgraded the credit ratings of the American International Group (AIG) insurance company forcing AIG — which had valued its subprime mortgage-backed securities at nearly twice the rates used by Lehman — to deliver $10 billion in collateral to creditors. Two days later the Federal Reserve confirmed that it had taken a 79.9% share in AIG in exchange for an $85 billion rescue package. AIG executives were under criminal investigation for misleading investors about how much the value of the company's credit-default swaps had declined. AIG had begun selling swaps that served as insurance against credit-default in 1998, and in 2004 expanded into swaps against defaults on Collateralized-Debt Obligations (CDOs) backed by securities such as mortgage bonds, auto loans and credit-card receivables. The computer models AIG had used to assess the risk of these Credit-Default Swaps (CDSs) did not account for potential write-downs or collateral payments. AIG had considered the risk of substantial payout to be small "even in severe recessionary market scenarios." The credit crisis was worsened by the mark-to-market Financial Accounting Standard 157 (FAS 157, enacted in 2007) which requires businesses to price their assets at the lowest price for which similar assets have been sold. The SEC forced banks to value their mortgage-backed securities, credit default swaps (CDSs), and similar assets by FAS 157. Financial institutions feared buying mortgage assets strictly on the basis of future cash flows, anticipating future mark-to-market paper losses that could undermine their regulatory capital and credit ratings. Weak institutions forced to sell their CDOs and mortgage assets at "fire sale" prices weakened the financial position of more credit-worthy institutions which were forced to slash the value of mortgage backed securities below the price that would be justified by cash flows (mortgage payments). The stronger institutions were thereby weakened and forced to sell assets of their own to meet minimum capital (or collateral) requirements, creating a downward spiral of asset devaluations, credit downgrades, forced sales and bankruptcy. Worsening the viscious-cycle, downward-spiral associated with mark-to-market accounting was the viscious-cycle, downward-spiral associated with ratings downgrade triggers. The credit ratings given by credit rating agencies (which assign credit ratings to various kinds of debt) affect interest rates and collateral required for debt obligations. The SEC-sanctioned rating agencies had been assigning triple-A ratings to junk mortgage paper, and SEC rules required money-market funds and stock brokerages to hold securities highly rated by the agencies. Credit rating downgrades can automatically trigger a requirement to post additional collateral for debt. A struggling company forced to sell assets at firesale prices to meet the additional collateral requirements can then be faced with another ratings downgrade — a "death spiral". AIG failed because of a ratings downgrade on its CDS contracts. The Lehman bankruptcy resulted in AIG being unable to find a market for the assets it had to sell to meet the increased collateral requirements. On September 22, 2008 Goldman Sachs and Morgan Stanley, which had been the last surviving investment banks, transformed into commercial bank holding companies, similar to Citicorp and Bank of America. Lehman Brothers had gone bankrupt, Merrill Lynch had been bought by Bank of American, and Bear Sterns had been bought by J.P. Morgan Chase. With no more investment banks, most U.S. financial institutions were regulated by the Federal Reserve. (SEC bureaucrats lamented their loss of importance.) As commerical banks, Goldman Sachs and Morgan Stanley no longer were required to value their assets by mark-to-market, and would have acccess to funding by bank deposits rather than money market borrowing. Investment bank leveraging had soared in recent years (Merrill Lynch leverage ratio of assets to capital had gone from 15 in 2003 to 28 in 2007, and Morgan Stanley's had gone to 33), but as commercial banks leverage would need to be close to 10. Moreover, the banks would have access to short-term borrowing from the Fed. The Bank Act of 1933 (Glass-Steagall Act) had separated securities trading (investment banking) from lending (commercial banking) in the interest of protecting depositors. With no more investment banks left, it was an open question whether the Fed would also seek to regulate hedge funds. The collapse of the credit market and stock market in the United States was followed by a stock market and credit market bloodbath worldwide — not surprising in light of the US debt and equity holdings of foreigners. The 2007 foreign holdings of US GSE debt was $1.3 trillion, 29% of which was held by China, 17.5% by Japan and 5.8% by Russia. Hong Kong investors who had purchased US$2.6 billion in risky Lehman Brothers products held protests. On October 3, 2008 the US federal government enacted the Emergency Economic Stabilization Act of 2008 empowering the Treasury Department to purchase up to $700 billion in distressed bank assets, (especially mortgage-backed securities) through the Troubled Assets Relief Program (TARP). Although TARP was based on the supposition that removing "toxic assets" would restore the financial sector to health, there was considerable controversy & confusion in the government about the pricing of those assets. Use of mark-to-market pricing might not help the financial industry very much, but paying too much would leave politicians vulnerable to accusations of "welfare to the rich" at taxpayer's expense. The Treasury Department abandoned efforts to buy toxic assets. On October 14 the Treasury Secretary announced a decision to instead use TARP money to buy preferred shares of the nine largest American banks. In purchasing preferred shares of banks, the US Treasury subsidized those with bad credit practices as well as the more stable ones (who had no choice but to comply) — thereby rewarding and providing incentive for reckless & incompetent financial practices. The statutory limit on the national debt was increased from $10.6 trillion to $11.3 trillion. Interest rates were cut and proposals made to increase credit by other means. Many banks were able to repay TARP loans thanks to their ability to sell more than a trillion dollars worth of GSE-guaranteed MBS securities to the Federal Reserve. In October 2008 the Federal Reserve took the unprecedented action of paying interest to the banks on the money they held that was in excess of their minimal reserve requirements. 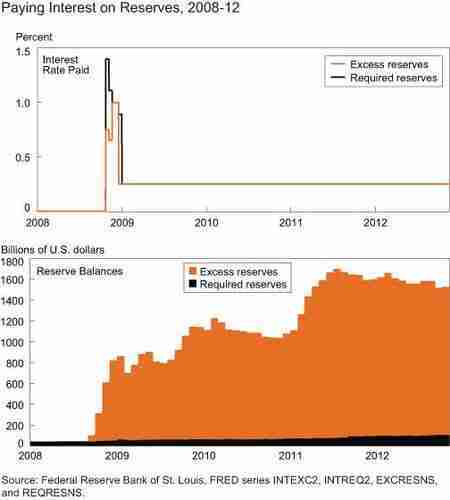 Banks had historically held a "relatively negligible" amount of excess reserves with the Fed, but the $2 billion held at the end of August 2008 had climbed to $1.5 trillion by the end of 2012. Banks historically loaned-out nearly all of their allowed reserves, but with the prospect of loan defaults in a weak economy, and with the 0.25% interest they were being paid by the Fed, banks found it more prudent to keep excess reserves. The Fed theoretically artificially lowers interest rates to encourage borrowing by consumers to stimulate the economy, but by paying interest to banks for not loaning money (to prevent inflation) the Fed is engaging in a contractory (and expensive) policy, in addition to the damage it does to credit markets by interest rate manipulation that discourages savings. TARP was originally intended only to help banks that were relatively healthy. But Massachusetts congressman Barney Frank (head of the House Financial Services Committee, who had earlier told the New York Times that claims that the GSEs had financial problems were exaggerations) added a provision that would give special consideration for certain banks that had lost substantial equity due to large holdings of GSE stocks and bonds — as well as banks which served low-income families. Frank made no secret of the fact that he was particularly concerned about OneUnited Bank of Boston in his home state. In October, 2008 the FDIC and Massachusetts regulatory officials took enforcement action against OneUnited on grounds of poor lending practices and executive compensation abuses. In September 2008 the Bank of America had agreed to buy Merrill Lynch. But by December, when Merrill's massive losses were showing no limit, Bank of America decided they had ample legal grounds to stop the deal. Federal Reserve officials warned that if the Bank of America was in future need of federal bailout money, the government would consider ousting executives and directors. Within a month a deal had been reached for the Bank of America to purchase Merrill with the aid of $20 billion in government money plus $118 billion in troubled asset loss protection. In 2008 the Bank of America had spent $4.1 million in lobbying, and Merrill Lynch had spent $4.7 million. With the collapse of US credit markets the US Dollar strengthened significantly against most other currencies, a consequence of fractional-reserve banking that caught many by surprise. Then, in an effort to "combat deflation," the US Federal Reserve drove the fed funds rate nearly to zero. The Fed poured massive amounts of newly created money into the economy by buying commercial paper, mortgage-backed securities and bundled credit-card debt, among other things — increasing Fed reserves by more than an order of magnitude, weakening the US Dollar against other currencies. The 2008 Presidential candidates blamed the financial crisis on "capitalist excesses", "predatory lending practices" and "excessive deregulation". Both parties promised to "clean up Wall Street" and impose stern regulation of the financial sector. Months after the election, public outrage was directed against AIG employees who had been pledged retention bonuses to stay with the troubled company — as if they had been the ones responsible for AIGs unhedged mortgage swaps. In a CONSUMER REPORTS poll, 26% of respondents blamed the financial crisis on lack of government oversight, and 78% of respondents wanted increased regulation of financial institutions [CONSUMER REPORTS; 74(1):24-27 (2009)]. This is ironic in that it was pressure from regulators and politicians which had been the driving force behind the subprime mortgage market and the securitization of that debt. Once again, disastrous regulatory policies (combined with government incompetence & corruption) that cause economic disaster leads to a public outcry for increased regulation. The Financial Crisis Inquiry Commission appointed by the US government to determine the cause of the financial crisis concluded that lax regulation and faulty risk management by households and Wall Street were to blame. GSEs were held to be only marginally responsible. The accusation that the years of the Bush Administration was characterized by deregulation is wildly at variance with reality. The politically ambitious hypocrite Eliot Spitzer elevated himself from New York Attorney General to Governor by his use of the 1921 Martin Act (an antifraud statute that relieves prosecutors from proving criminal intent) to extract costly settlements from Wall Street firms. As the "people's crusader against Wall Street" Spitzer drove the CEOs of AIG and other firms from office, with disastrous results for those firms and for the economy. The Sarbanes-Oxley Act of 2002 (enacted in reaction to the Enron, WorldCom and Tyco accounting scandals) imposed costly accounting regulations that were particularly onerous for small firms. The number of American companies deregistering from public stock exchanges nearly tripled after Sarbanes-Oxley became law, and there were few new foreign listings on the New York Stock Exchange. Even New York's liberal Democratic Senator Charles Schumer sought revisions to reduce the exodus of companies to overseas stock exchanges. The 2007 imposition of mark-to-market accounting by the SEC greatly amplified the crisis created by securitization of subprime mortgages. The two terms of the Bush Administration was associated with a 68% increase in spending on regulatory agencies — greater than the increase associated with the administrations of any of the six preceding Presidents. 2016 Presidential candidates have claimed that the financial crisis was associated with the repeal of the Glass-Steagall Act, which had separated commercial and investment banking. But Glass-Steagall had nothing to do with the promotion and implicit underwriting of poorly secured mortgages by government regulators, which was the real cause of the crisis. In 2011 the Federal Reserve purchased 61% of U.S. Treasury securities, in contrast to negligible amounts purchased before the 2009 financial crisis — artifically depressing interest rates on Treasury bonds during a time of massive deficit spending financed by government borrowing. Foreign purchases of Treasury securities declined to 1.9% of GDP in 2011 compared to 6% of GDP in 2009, and U.S. private sector purchases declined to 0.9% of GDP in 2011 compared to 6% of GDP in 2009. In 2012 the Fed began expanding its "Operation Twist" to purchase bonds of longer maturity — a departure from its historical practice of operation at the short end of the yield curve — to drive down long-term interest rates. Fed holdings of bonds with maturities exceeding 5 years were increased by over $500 billion. In December 2011 the SEC announced lawsuits against six top executives of the Fannie Mae and Freddie Mac. The SEC charged that the GSEs hid the size and riskiness of their subprime mortgage holders from investors, ratings agencies, and financial regulators. Ironically, also in 2011, the Federal Housing Finance Agency (the government agency controlling the GSEs) sued 18 financial institutions for misleading the GSEs about the quality of loans underlying the mortage bonds sold to the GSEs. By the end of 2013 the FHFA had reached settlements with 6 of the 18, collecting $7.9 billion. It was the unregulated GSEs, their crony pseudo-capitalists, and their pork-barrel political allies who wrecked havoc on the financial system — with help from the misguided economic policies of Keynesians & Monetarists. Business people were responsible to the extent that they were bullied by politicians into making bad loans, or relieved of any responsibility for being concerned about risky loans because of implicit government guarantees. Loans were made to people who could not repay them rather than to businesses that could have used the money to increase production & employment. The naive belief that politicians & bureaucrats have the morality & competence to regulate businesspeople & the economy can only lead to waste, economic chaos and loss of freedom. This is not to say that no politician or bureaucrat has ability or good intentions, but they should not be regarded as divine beings and it is wrong to think that their judgments are superior to those that result from free competition subject to laws against fraud. Too many people think that the economy is too important to be left to the market, but it is instead the case that the economy is too important to be left to the politicians and bureaucrats. The goals of the Obama Administration are to follow the example of Franklin Roosevelt during the Great Depression, by Keynesian spending programs intended to create jobs and "stimulate the economy". Government money can only come from taxing or borrowing money from people who would have otherwise invested the money more productively. The Bush Administration was an example of massive government spending increases that hampered economic growth. Gordon Tullock, an economist who helped found "public choice" theory, wrote a critique titled "Why the Austrians are Wrong about Depressions" based on an account Austrian economist Murray Rothbard wrote to explain Austrian theory to the general public. Tullock said that Austrian economists are hypocritical in crediting entrepreneurs with such wisdom in resource allocation, but so much stupidity in not being able to avoid being misled by central bank interest rates. Austrian economist Roger Garrison has compared central bank interest rates to a jammed radio signal — one can know that the signal is jammed without knowing what the unjammed signal is. Even if most businesspeople understood Austrian theory, the challenges of knowing how much the central bank is distorting natural interest rates may be more than most businesses, especially smaller businesses, can accomplish. Undoubtedly some businesspeople learn to anticipate the effects of central banks, but not enough to nullify their effect. Instead of businesspeople being guided by market realities, they get caught in a dysfunctional cat-and-mouse game of trying to second-guess the Fed, who is trying to second-guess business and speaking in tongues so as not to be second-guessed. If there is a widespread expectation that interest rates will be raised, investment & spending may be deferred — leading the Fed to not raise rates. Stock market sell-offs because of low unemployment (indicating a healthy economy, but also suggesting that the Fed may raise interest rates) are an abberration produced by the Fed's choke-hold on economic activity. Investors profit from guessing how the Fed is being manipulated by political forces rather than by discovering opportunities for capital to increase production of wealth. Prudent businesspeople must compete with ill-conceived start-up companies to keep competent engineers, lawyers and executives — thereby driving up their costs even if they are aware of the artificial credit-expansion. The availability of apparently cheap capital is a hard temptation to resist when faced with the threat of competitors who are expanding their businesses. The broadening of credit beyond the business sector has also widened the scope of influence of economic manipulations by the Fed — as seen in the American housing boom & bust. Tullock asserts that even if capital has been malinvested into building too many factories, apartment buildings, airplanes and other expensive machinery, that these items can still be used to produce useful goods & services — benefiting the economy. But extra factories & airplanes will not be used when existing ones are more than adequate to cover depressed demand. There is no incentive to complete partially-finished projects that have no hope of justifying the costs. Distorted interest rates will have caused wasted economic activity which detracts from production of wealth, contributing to depression & unemployment. Tullock describes economic ups and downs as a "random walk" rather than a cycle. But Austrian economists are not saying that business cycles are a sine curve. The cycles follow the market-distorting movements of central banks that lower interest rates to "stimulate the economy" or raise interest rates to "fight inflation" — purportedly aloof from political influence. Tullock sees nothing much wrong with inflation, and sees no reason why central banks should trigger recession by hiking interest rates. But inflation feeds on itself as people begin to anticipate inflation. People stop saving and will buy any real goods as a means of holding on to value — causing the inflation to exceed government monetary expansion. The devastating effects of inflation on economic planning & material well being are too great for central banks, politicians or voters to ignore. Economist Paul Krugman has criticized Austrian theory with even less effort to learn about it than Tullock. In his essay "The Hangover Theory" Krugman does not even understand the necessary connection in Austrian theory between the malinvestment boom following central bank interest rate policies — saying that in Austrian theory the boom could as easily be due to "irrational exuberance" of entrepreneurs. Krugman wrote that Austrian theory merely describes business cycles without explaining them. Krugman complains that all industries suffer in a recession, not just the investment sector. But Austrians would say that central bank rate tightening to fight the inflation it has created will depress demand in all sectors. This is all the more true because of the widespread use of credit in modern society, as noted in the American housing crisis. When Austrian theory was formulated use of credit was more restricted to business activity. As a Keynesian Monetarist, Krugman believes the cure for depressions & recessions is for central banks to "stimulate the economy". Instead of reasoned criticism of Austrian theory, Krugman dismisses it as a prudish moralism against the idea that government printing of money can have a positive effect. Economist Bryan Caplan, unlike Tullock or Krugman, has studied Austrian economics before criticizing it. Section 3.4 of his essay "Why I Am Not an Austrian Economist" deals with his criticisms of Austrian Business Cycle Theory. Much of his criticism is along the lines that Austrian economists are wrong to think that they have ideas that are distinct from ones that are part of modern neoclassical economics. Caplan is lucid in his explanations about why Rothbard is wrong to attribute all wage rigidity to governments & unions and about why all durable goods production — rather than just capital goods — would suffer from depression/recession (somewhat in agreement with the analysis of the American housing sector boom & bust discussed in the previous section). Caplan claims that Austrian theory predicts that output will increase during depressions, but it is not clear why he would believe this — especially in light of his lucid analysis of durable goods. If Austrian theory did predict an increase in production in depressions it would clearly be wrong on that point, but the essential thesis of Austrian business cycle theory is that manipulation of interest rates by central banks is the cause of boom & bust market distortions. Caplan's strongest objection to Austrian business cycle theory is that it "requires bizzare assumptions about entrepreneurial stupidity in order to work: in particular, it must assume that businesspeople blindly use current interest rates to make investment decisions." As discussed in connection with Tullock, it may be far more difficult for people to anticipate future interest rates than academic economists assume — especially when so few are familiar with Austrian theory. If more people understood the damage caused by central banks, they would be abolished — along with all government-created money. Austrian business cycle theory was formulated during an age when most borrowing was done by businesses to finance business activity. Nonetheless, the essential thesis that artificial interest rates by central banks creates an inflationary "boom" that misallocates resources remains true, even if the effect is not always initially on capital goods. It also remains true that the central bank will ultimately be forced to contain the inflationary nightmare that it has created by tightening interest rates and creating a "bust" (recession/depression). How can it be said that a free economy — a capitalist society — exists anywhere in a world where money & interest are so heavily influenced by central banks? Fascism and socialism are more appropriate words for economies wherein money & interest is deemed to be so important that only benevolent dictators can be trusted to control them. If market forces cannot be trusted to set prices for money (interest rates) why shouldn't government control the price of food, cars, computers and everything else? Just as business people take the blame for rising prices when governments inflate money, depressions & recessions are blamed on greedy capitalists rather than central bankers — and there is demand for more regulation. If regulation were the answer to prosperity, totalitarian Russia would have thrived instead of collapsed. The efforts of Keynesians or Monetarists to "stimulate the economy" by government spending or expanding the money supply are like 18th century physicians trying to cure patients with bloodletting. Governments only get money by taxing, borrowing and inflating, so any money the government has will be taken from others who could do more for the economy with the money than bureaucrats or politicians could ever do. The source of economic growth is investment in productive resources, not consumer spending. If enough business people, economists and citizens come to understand the effects of central bank manipulations there would be hope that the market could become efficient enough to avoid boom & bust malinvestment & recession. But if enough people came to this understanding, they might be wise enough to abolish central banks and take money-creation out of the hands of governments. For more details on the free banking and free-market money, see my essay Monetary Systems and Managed Economies. For more on the subject of the source of recessions, and on the claim that consumer spending is the source of economic growth, see my essay Say's Law and Economic Growth.